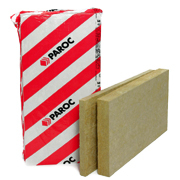 Rendered facade slab PAROC Fatio is non-combustible stone wool insulation for use as a base layer of both thin and thick rendering facade in existing and new buildings. The rendered facade insulation slab has excellent thermal insulation and alkali resistance properties. It doesn't accumulate moisture or react to changes in temperature. With the rendered facade insulation slab you can easily create a smooth base layer for thick rendering in case of an uneven surface of the supporting wall. At the same time, you will improve the sound insulation and increase the fire resistance of the external wall. Slabs are installed with the red marks against the supporting wall with mortar adhesive and fixed with mechanical fasteners. The slab shall be installed with the marked surface against the wall.